Like almost everyone who grew up in the 80's and 90's, The Simpsons became my favorite show almost the instant it started. And it took a while for it to be supplanted, too. The Simpsons had at least seven great years before running out of character-based humor and interesting stories. And this is the one that started it all. 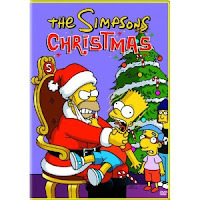 Oh, sure, the characters were on the Tracy Ulman show prior to getting their own program, but they didn't enter the public consciousness until the Simpson's Christmas Special, more accurately called, "The Simpsons Roasting on an Open Fire." I remember seeing this when it first aired. In a world that's seen Beavis and Butthead, South Park, and Adult Swim, it's hard to convey the power these characters had when they got their first half hour all to themselves. But The Simpsons predated all that: before Bart, the most subversive animated character most of us had seen was Fred Flintstone. To be honest, I wasn't expecting this to hold up at all. How wrong I was. This is everything I remembered it being. The jokes were still funny, the characters still strangely endearing. Sure, the bit where Bart sings the "Batman smells" lyrics to Jingle Bells seems a bit tame, and there were a few other scenes that came off as dated, but, by and large, this was as much fun to see as it was when it first aired. If you haven't seen this in years - or, worse yet, if you've somehow never seen this - find a copy. It's definitely worth watching.